And so… I’ve been teaching singing for 15 years, but it’s something that I haven’t been shouting about all these years. 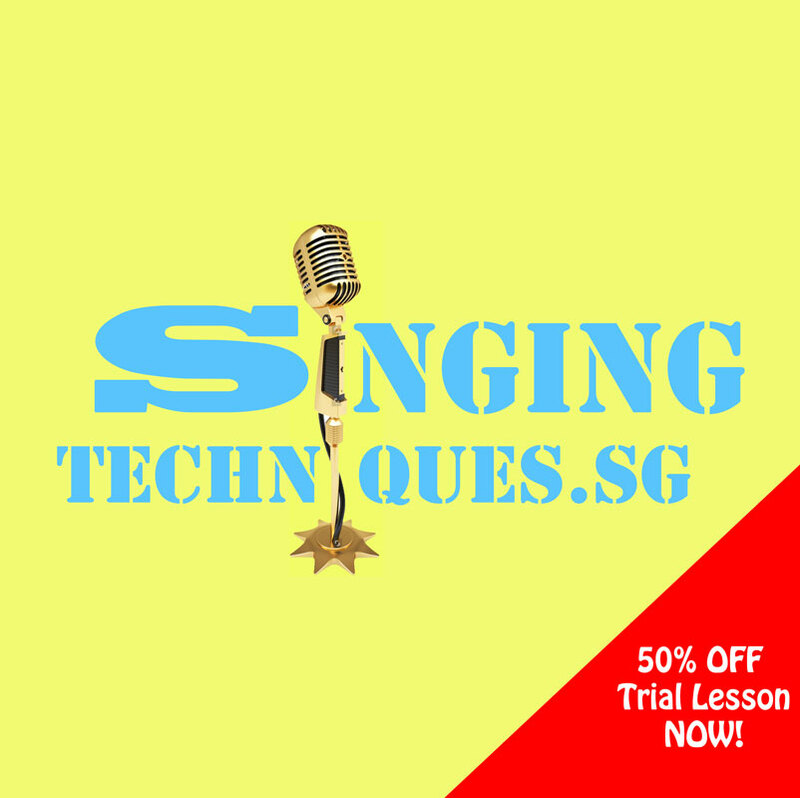 However on reflection, teaching singing is the one thing that has proven itself over and over again that is least effortful for me, and most impactful. The satisfaction of seeing my students improve week after week, and over duration of months and years is indescribable. 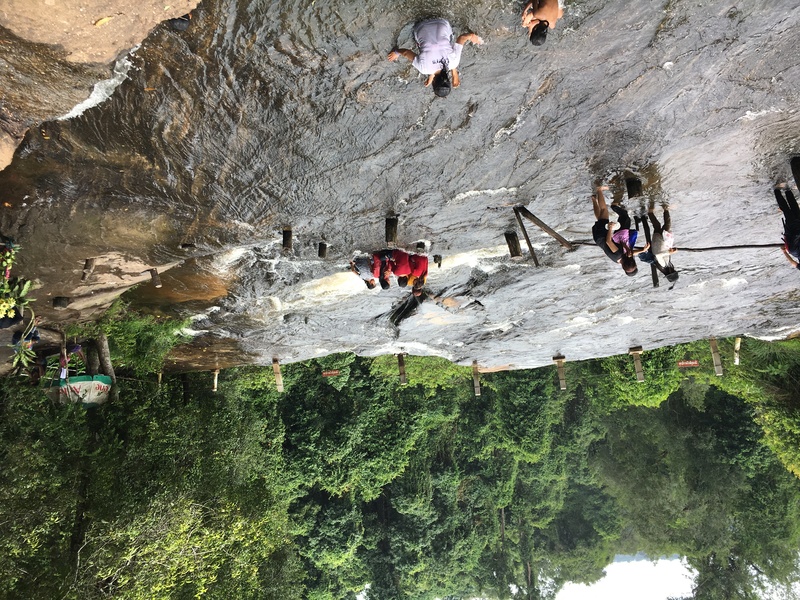 Sometimes I do wonder how full-time teachers (be it academics or passion-related activities) can do this year in year out, but sometimes i do catch myself understanding – because the satisfaction can be immense. 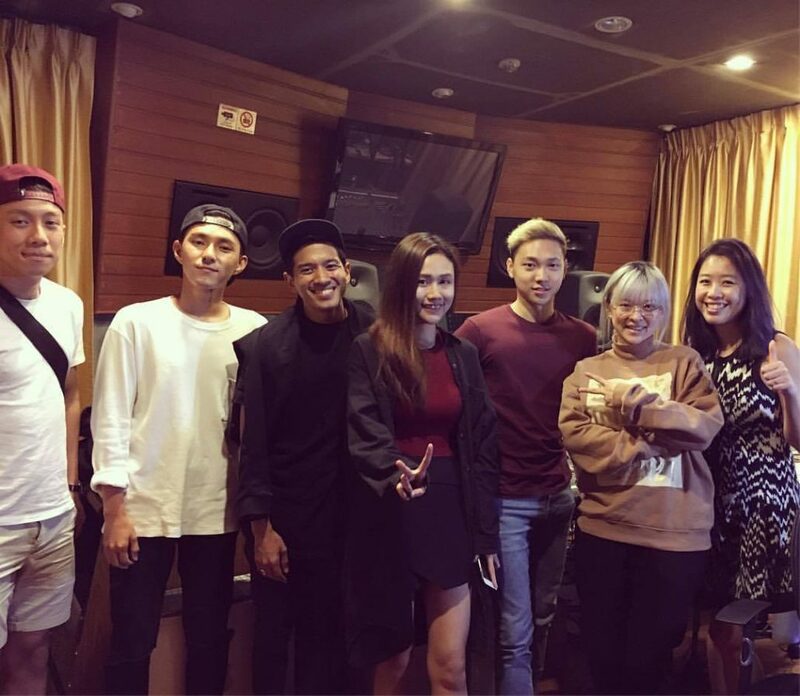 Hear the Hua Wei jingle here, which features The Voice Singapore contestants..and vocals produced by me! It was so fun to get to know each of the contestants’ unique vocal tone and singing style, assign them lines and create harmony lines etc. Where do I start.. everything has changed so much since my last post. 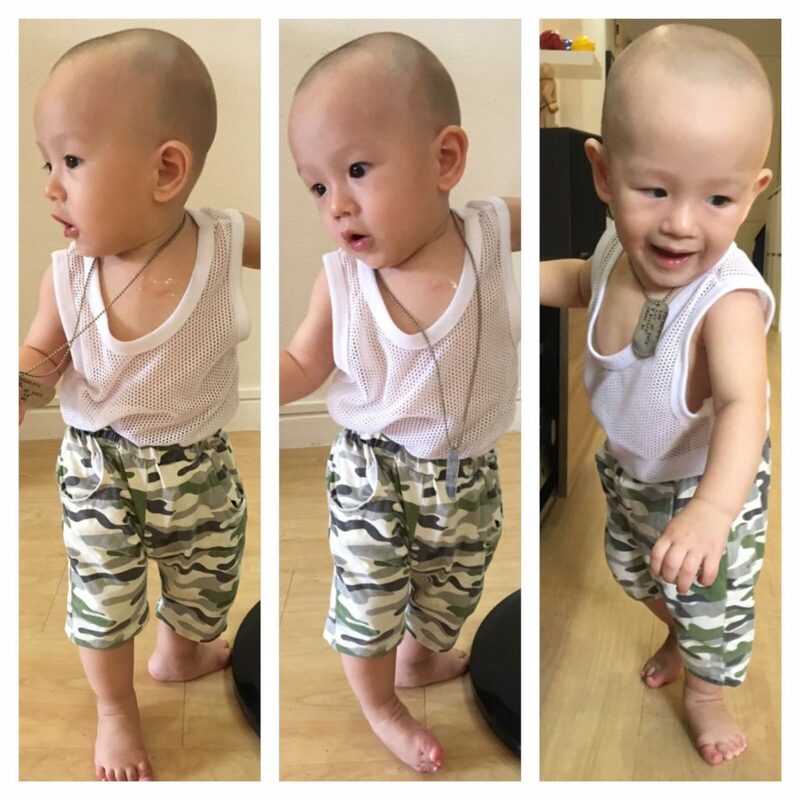 The biggest change being that he started… walking at 9 months! Never did I imagine that he would start to walk so early. 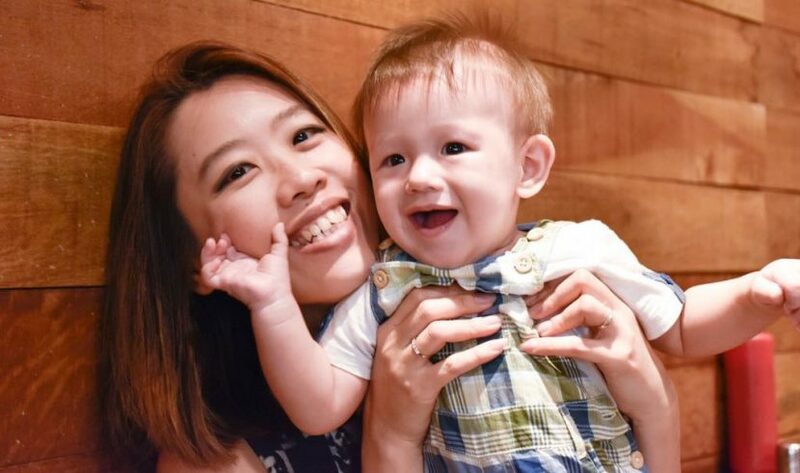 Some would celebrate the early onset and for me, I think I’m just surprised, but also relieved that I don’t have to go through the worrying phase of ‘when is my baby going to start to walk?’. The downside is, the chase starts earlier too! But yes, now that he walks, he practically walks from the moment he opens his eyes right to the time when it’s time for the next nap. NON-STOP. And that can be an hour up to 2 hours. Unless we grab him for a meal, or sit him down for some play time, he would just keep flapping his arms/hands and walk round the whole house (almost like a headless chicken). My parents have been chiding me for not feeding him enough because he is so skinny. Hello!??? When you have a baby who walks 1-2 hours, 3 times a day, how to put on weight?? …and the first (and only time) we caught him doing this! Why he was kissing himself.. we had no idea…but my favourite bit was when he noticed us looking at him and he backed off lol. Don’t ask us why we don’t bother buttoning the end of his romper. Ok, we are just plain lazy haha, and well sometimes it’s good not to have it too tight down there you know! Other than walking, what I love about this 9-10months age is that he now knows how to come to me and hug my thigh when he wants attention.. or raise his arms when he wants to be carried..and rest his head and body on my chest when I carry him upright… it’s such a sweet feeling to be wanted/loved by a baby…(no wonder people keep procreating despite all the tiredness and hassle..well there’s got to be some perks to warrant having offsprings!). The downside is, we have bought all sorts of baby safety measures and gates, it feels like the whole house is on lock down. And did I mention that he now loves to swing doors open and close…which means he sometimes shut the door with himself all alone in the room. Wahahaha how clever. 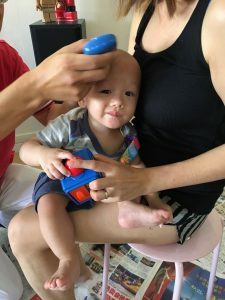 Well… we did shave his hair at 4 months… but the husband did it himself and we were so afraid of hurting him that we left quite a length from the scalp, so that really wasn’t “shaving”. After his hair grew out, we realised that his hair was really sparse (and uneven)…and under the incessant nagging of my mum, we decided to shave his hair for real after all. Because some Chinese believe that if you shave the baby’s hair, the hair will grow more in volume. (I realised that it’s most probably a myth after talking to some friends, AFTER shaving his hair this time round. For instance, I have a friend whose eldest daughter had her hair shaven but her hair turned out to be sparse and thin; her second daughter did not get her hair shaven, and yet her hair is now thick and full of volume). Oh well. We don’t really mind, it’s just hair, and hair grows. For me, if it makes my mum happy, it’s worth the effort. Plus perhaps the hair can grow out more evenly this time round (because the husband isn’t the one doing it muaha). This time round we got an expert from Huat Sing Baby Souvenir to come to our house to do the shaving. I thought that it’s so awesome that we can stay home! 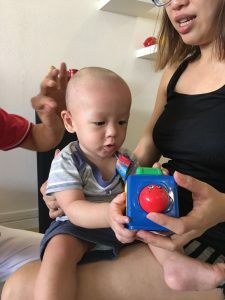 Then I realised that he wanted the baby to be in a familiar environment so that there is as little disturbances to his mood as possible…(and it’s only $38 for him to do a home visit). And boy, the master was SO FAST! Basically, Dave’s hair was gone in under 2 minutes. The master suggested that we use his hair to make a calligraphy brush. I was not interested, but the husband was (how typical of angmohs, i think). For me it seems like a ‘nice-to-have’ but not a necessity. 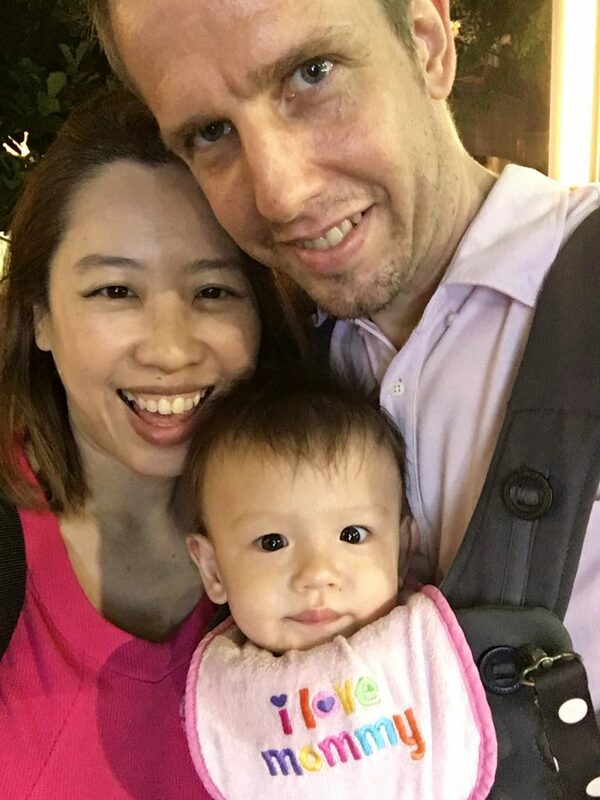 But of course, for a mixed couple, somehow the angmoh is the one more interested in the Chinese culture (ok oops, i recall i am super into Downton Abbey. Ok so we are fair and square). And so we ordered for one set, complete with a nice Chinese saying “品学兼有，人中豪杰”. I think I would be quite stressed if I were the one to have such high expectations pegged to my name. The running joke with my parents now is… maybe when the hair grows out, it will become black again. HEHE. 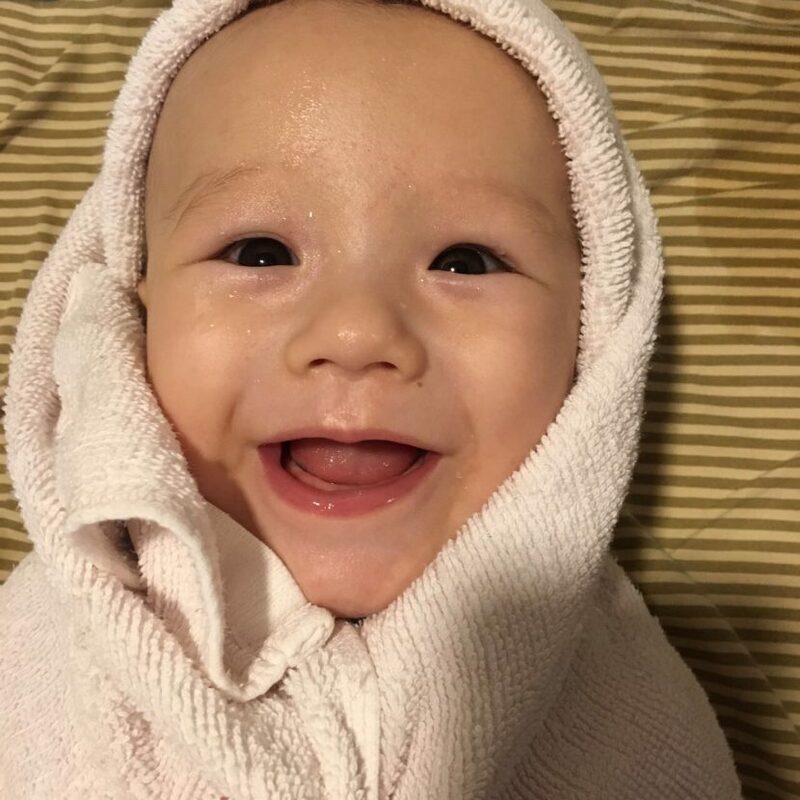 8th month is such a fun age…He laughs and responds and is playful. But he has started to become clingy, and once we turn our back to him, he howls (though sometimes we know it’s a fake howl just to get attention). Time seems to fly by now and I don’t have much time to myself in between trying to feed him (seemingly non-stop a day), soothe him when he gets bored of playing by himself, and then try to get him to sleep. I think I am a semi-SAHM, and I am quite happy with the balance. But as he grows and needs even more attention… .we shall see…. 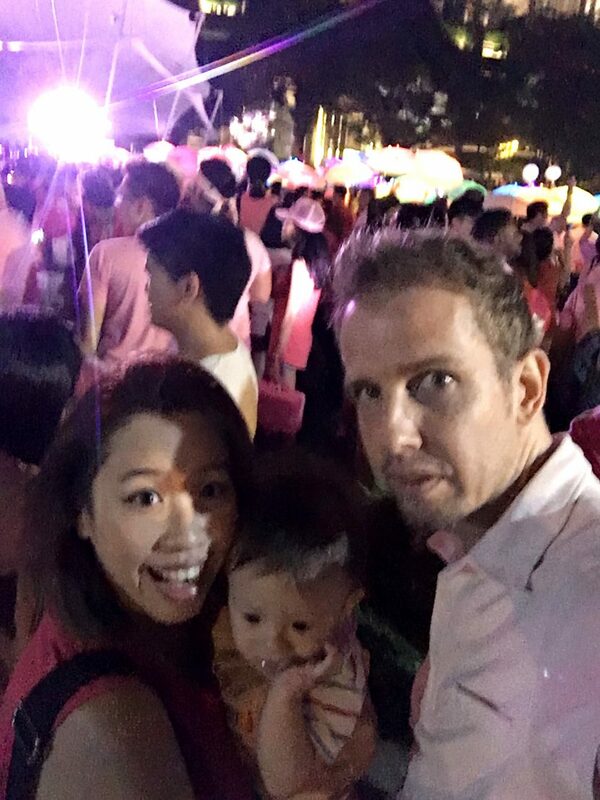 It is my first time participating in the annual Pink Dot event at Hong Lim Park… and this time round, I felt it imperative that I participate and take Dave along. It’s very simple really, so I’m going to keep this short. Now that I have a son (or daughter for that matter), I can say it aloud that if Dave should be gay, it is my wish that the society he lives in (esp in 15 – 20 years’ time) will be accepting of him, and will love him for his personality and achievement, regardless of his sexual orientation. I have to say though that I am not wishing for Dave to be gay… I think it’s hard to fight the DNA that is hardwired in me to want to have biological offsprings (I want grandkids!! No pressure, Dave!). And though the world is getting more and more progressive and open-minded, there remains pockets in societies who frown upon LGBT and see them as a ‘lifestyle’; and the mama bear in me just wants to protect him from discrimination thrown his way just because he is who he is. But if he is meant to be, then i want him to feel that it’s ok to be such. Because the law (would) say so, even though some religions may frown upon it. Thank goodness Singapore is a secular country. Can you imagine if we have to stone adulterers or have to cut off hands of thieves because certain holy books say so? I don’t think nitpicking what is in favour for us should be the way. There are many things in life you don’t get to choose when you were born. Colour of your skin. Type of body (damn, if only i could choose to have a petite body frame with a super high metabolism). Who your parents are. Who your family are. Which country you are born into. The world is not fair, but if any of us can try to make it a little more equal when we can, we should. And if any action gives more love and less hatred, how can that be wrong? On hindsight, my secondary school English literature textbook “The Chrysalids” has since young imprinted in me a very strong sense of injustice for people who are not born ‘the norm’, and are generally not accepted in the society. The sense of persecution was not lost on me as a teenager reading the book. I always thought, what if it was real and I am persecuted because of something I can’t change? I still keep the book to this day. (Side note: I just realised that the male lead in the novel is also called David). Before I could warm up to the fact that he could sit up by himself… a few days later, he started to stand up on his own. And now that he can stand up, he ALWAYS wants to stand up, almost as if there are nails on his backside if he sits down. Other than realising what superb upper body strength he has (cos he likes to haul himself up to stand), I realised that he can also use his thumb and forefinger to pick things. The first time he looked at his pacifier and stuff it back to his mouth, i gasped. How did that evolve all of a sudden? In fact, i swear his growth (both physical and behavioural) every single day is visible. 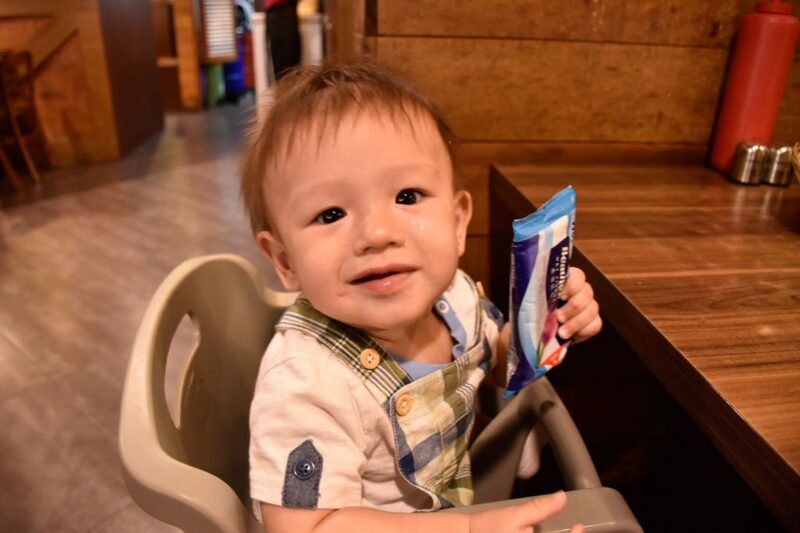 It’s astonishing looking at pictures of him taken 3 weeks ago and realise just how much he has grown since (which always make me think about how I am growing old too). 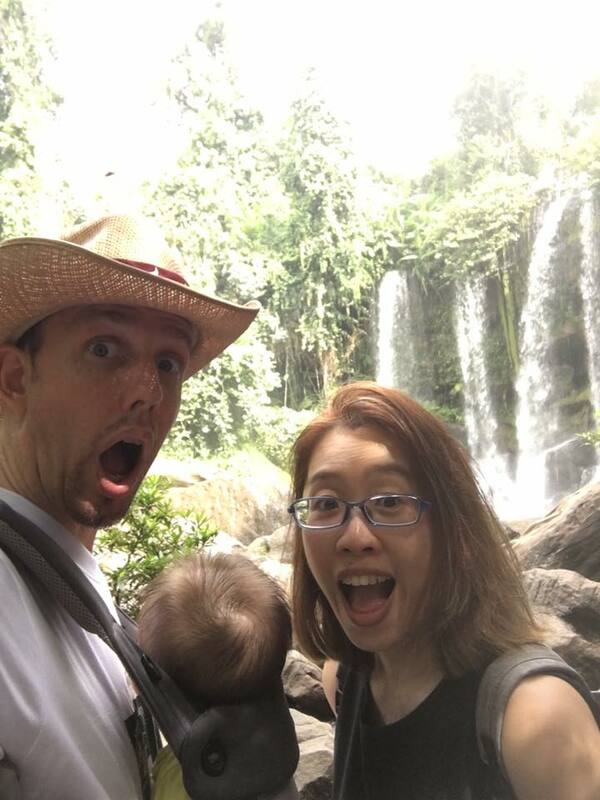 It turns out that the first trip of his life would be to Siem Reap, Cambodia (with his Singapore Passport because there is no irritating visa to apply for). 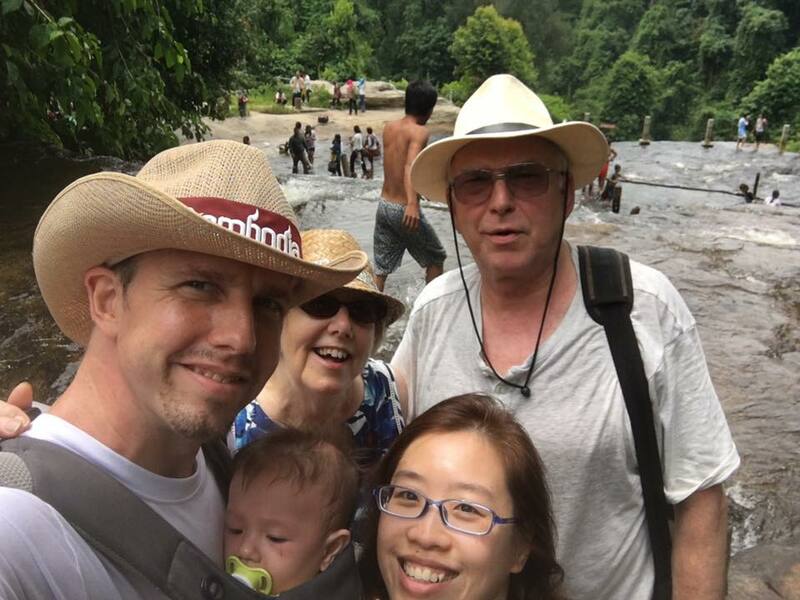 We visited Angkor Wat, Angkor Thom, and 2 other temples with many steep steps; and trekked over a running stream and climbed up and down steep slopes, steps and rocks to reach the bottom of a waterfall. Having a baby around has its perks I must say. 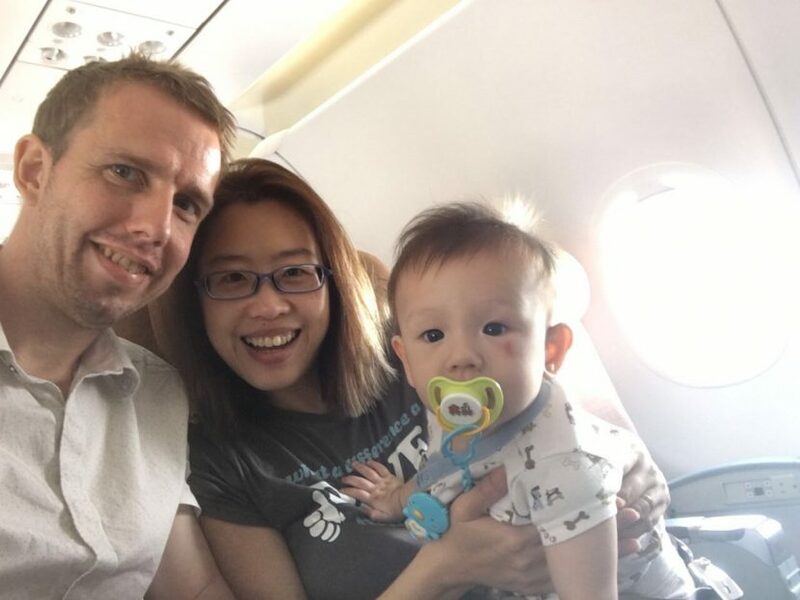 We got to board our flights earlier; we elicited smiles everywhere we went; we got nice baby meals and toys on-flight; we looked at Dave and got cheered on by his smiles when we felt tired; we took extra measures for safety because we wanted him to be safe too. 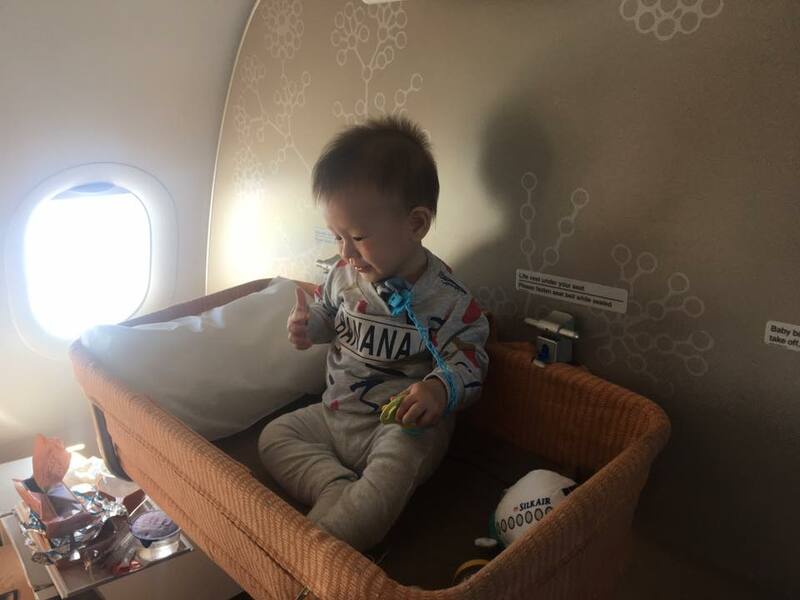 But the bassinet on-flight is a weird experience for us, and we don’t know how anyone can have their > 6 months old babies (who can sit up and crawl) safe on the bassinets. 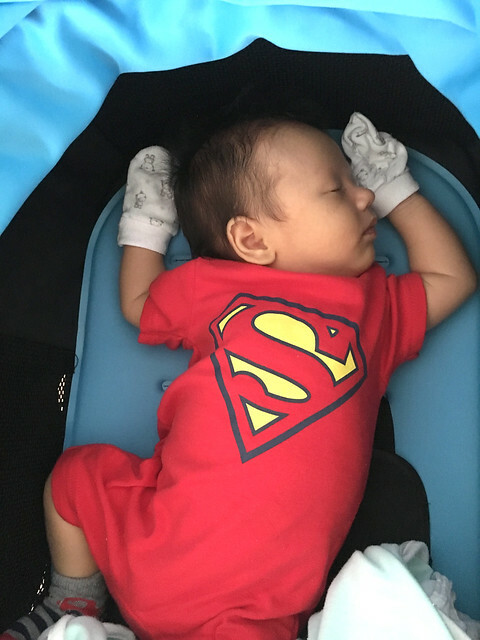 I imagine if we were to take long flights and we lay Dave down on the bassinet when he has fallen asleep (all zipped up), I still wouldn’t be able to sleep well, cos what if he somehow manages to wriggle out of the zip and fall out of the bassinet? (I say this cos he actually wriggled out despite the zip, and half-fell out on one episode). Let me know your thoughts. Packing luggage with a baby in tow is such a b*tch. We started to run out of milk powder on the 4th day (I deliberately brought a travel size tin, because smart-alec mum thought that we could save some luggage space). Luckily there’s a huge supermarket that sells Similac, so we bought it and mixed it in with Nan (our preferred brand), in case he doesn’t like the new brand. Actually our worries were unfounded because apparently Similac is sweeter. 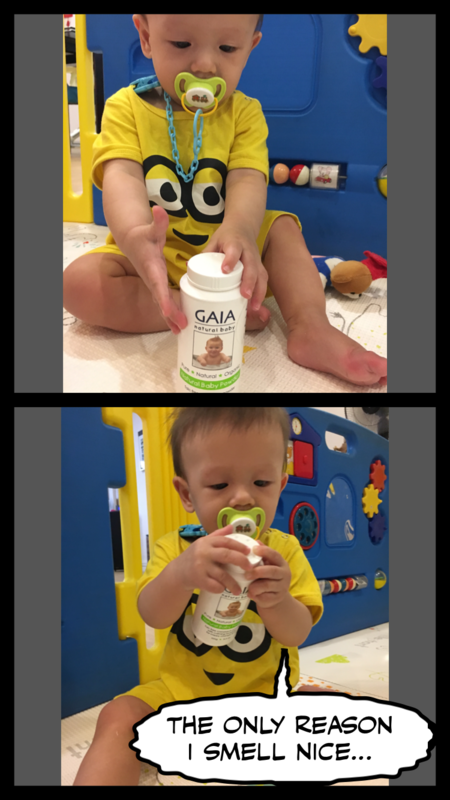 But after we saw the explosive and overflowing fountain of poo (from 2 days of constipation) after drinking Similac, no thank you, we are sticking back with Nan. 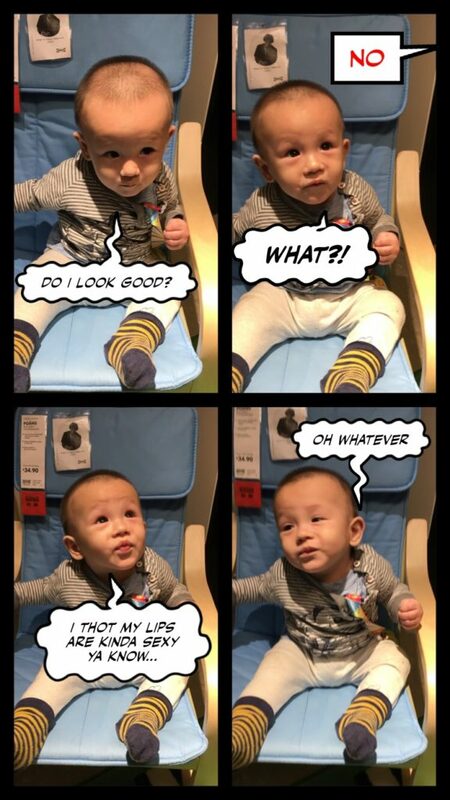 I remember telling friends the first 2 months of babyhood is really boring for parents. Babies just drink, poo, pee, and sleep. Oh and yes they cry, sometimes for no good reason. 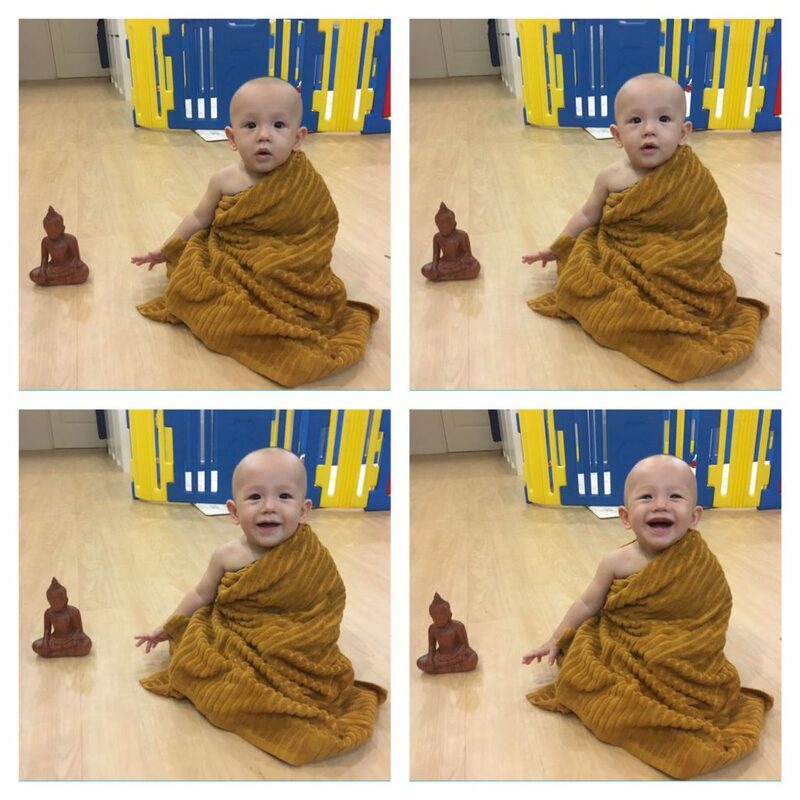 However from the 3rd month onwards, they turn interesting… they start to smile back (genuinely) when you smile at them! Finally, they are responsive! I find 6 months a very interesting stage… this is when Dave has learnt how to stretch his arms and hold his own body up…and then we realised it only took a few more days before he learnt how to have his legs fold up to accompany his arms too… and there we go, the beginning of a crawl! He hasn’t learnt how to crawl at this stage, just movements here and there enough for us to find him facing a different direction soon after we left him. Look how fast he has grown! 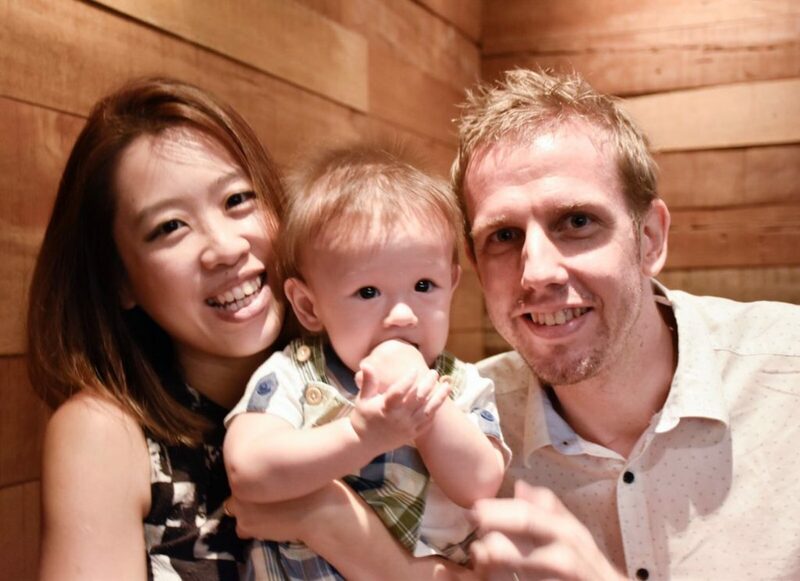 One good memory I’d love to keep for a very long time – I was feeding him one day and he stretched his hand up in the air as he usually does, but this time round he looked at me with his wide eyes. So I decided to gently nibble his little fingers… and he chuckled! That to me seemed like the first ‘play’. Interestingly, a day after I did that, he didn’t chuckle anymore… has it become a norm for him so soon? Then one day while my mum and I were talking, she suddenly turned and see him sat up like this! How did he manage to do that?? To see the potential of a baby unfolding is … awe-inspiring. It’s almost as if there is a programme encoded in us, and the actions unleash once the time lock is up…. 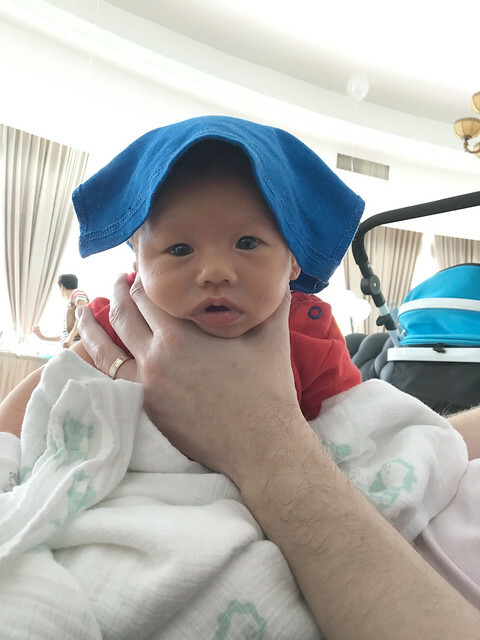 Hello Dave, just know that you have now discovered muscles on your abdomen, neck and fists, and are now banging your fists on my face uncontrollably, knocking your head against my spectacles, and that your poop is starting to smell real funky as we progress to solid food. But I shall leave that to my next post. 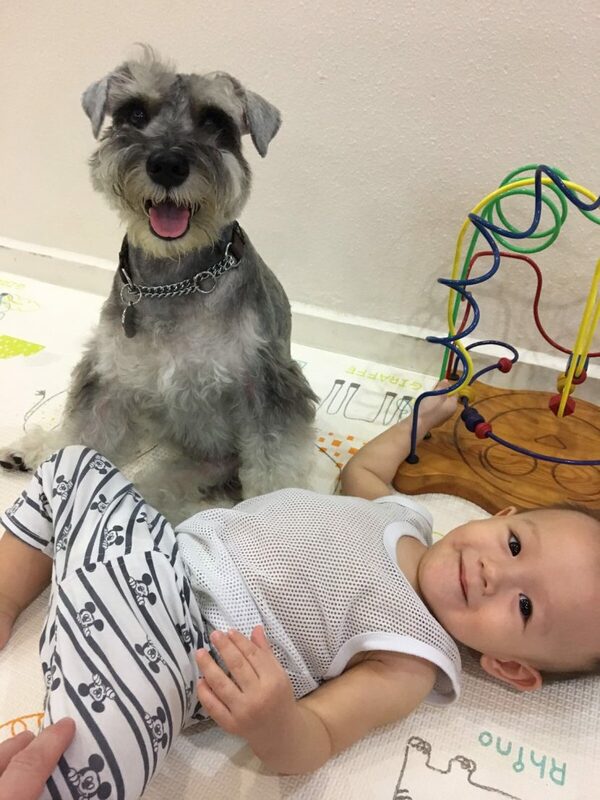 Dogs and babies – we’ve seen so many cute photos and videos of them getting along together but we knew that Buddy wouldn’t take to baby Dave even before Dave was born. 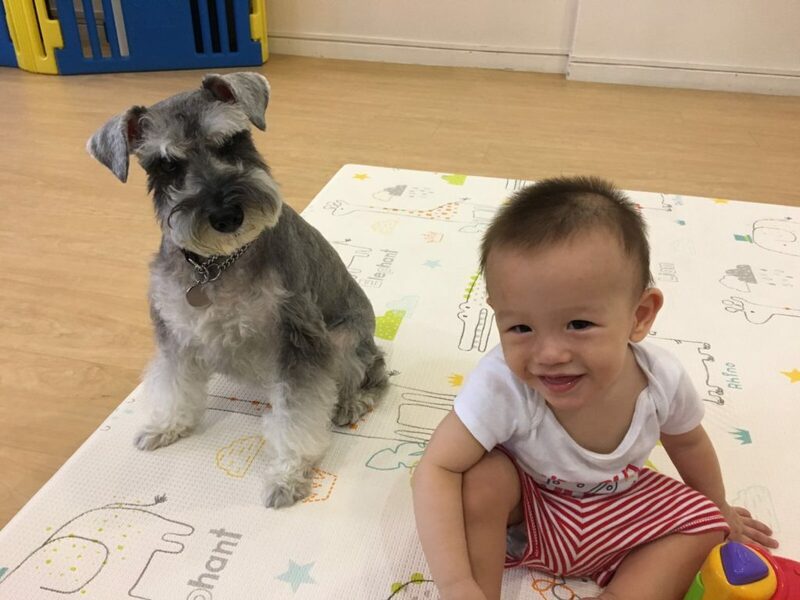 We got that answer in a scary way when, as a trial, we had a monkey soft toy masqueraded as a baby in my arms – Buddy growled and whined and jumped to bite the monkey’s tail or leg every single opportunity he got. Someone told me that dogs don’t get jealous – they are just territorial. In short, Buddy thought that I was his possession and this new love-of-my-life-monkey was taking me away from him. 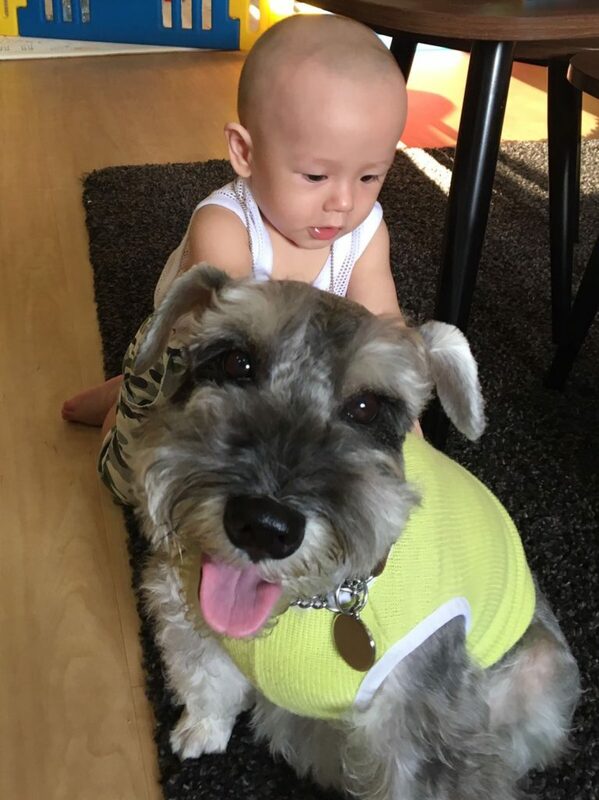 So when we carried Baby Dave home for the first time, other than being very very tired, we also had to deal with the real fear that Buddy would attack the baby any chance he got. The first night when I had to breast feed Dave in the middle of the night, I carried him to the other room, for fear that Buddy would jump onto the edge of my bed and bite the baby’s foot. Seated in the armchair in the study room and with door ajar, I wasn’t prepared for what I thought was the most heart-wrenching sound I had ever heard from Buddy. It was a howl of despair and exasperation…. and I thought that it sounded like he actually cried too. Honestly, it nearly killed me. It was also very tough to have to keep reminding myself that as much as I love Buddy to bits, this new fragile life (whom I didn’t love as much as I loved Buddy back then), was counting on me. Here’s Buddy meeting Dave – what you didn’t see in the video was his growling before we laid Dave down into his cot. So for the first 2 weeks, we were extra vigilant; Buddy could not go near the baby within 2 metres, and if we carried Dave, we had to carry him really high up in case Buddy jumped. Actually he did jump and tried to bite Dave’s feet….unsuccessfully for the first two times. The third time, I let my guards down just a little while breastfeeding on the bed, and before I knew it, Buddy had run across the room, did a leap and took a bite out of Dave’s foot. Dave immediately let out a howl, I let out a big yelp, Buddy dashed away and my husband came stomping over – it was a mad house. Luckily Dave had thick socks over him, and it was an indent and no blood was drawn. I don’t know, but in Chinese we have a saying, 手心是肉，手背也是肉 (both the palm and the back of a hand are flesh – both are dear to me). 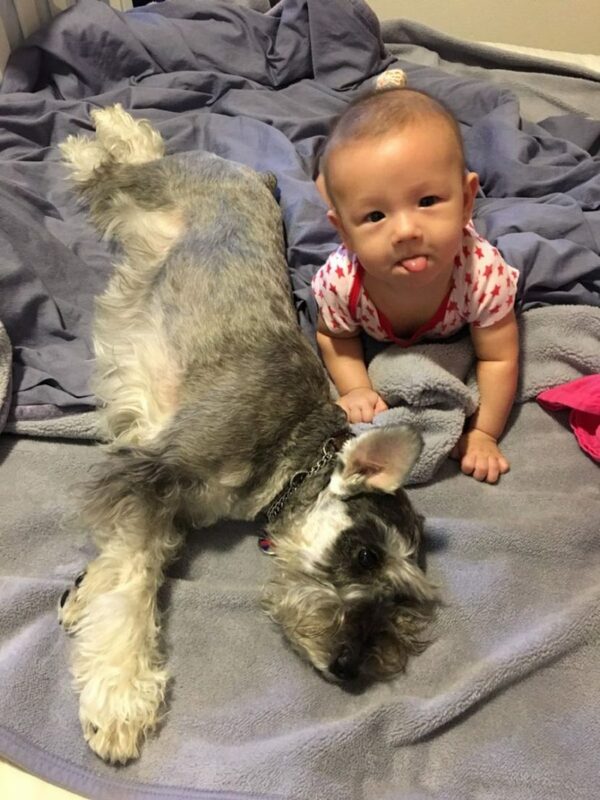 We did not want to punish Buddy and make him hate the baby even more, but he had to know that what he did was wrong. (Actually he did, cos he did the furtive escape-and-hide knowing that we were furious with him). I sought the advice of a friend, and we left baby Dave’s soiled clothes on Buddy’s bed. I let him smell and chew and lie on the clothes; i didn’t care what he did with them. I just want him to recognise and own the smell. Then something strange happened. In the 3rd week, a cousin came to visit me. We just came back and Dave was still in the stroller – when she walked over to the stroller to see Dave, Buddy barked at her. Buddy barked at her?! It was such a small sign but one of huge significance! 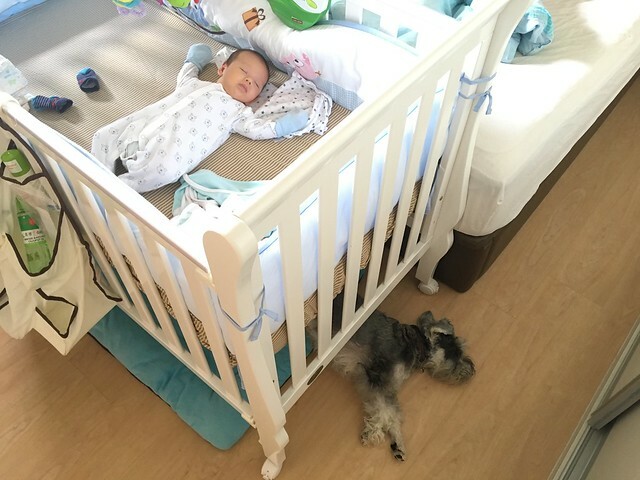 That’s when we realised that Buddy was beginning to protect the baby! We continued to monitor for signs, and realised that Buddy was becoming more and more relaxed at the presence of Dave. 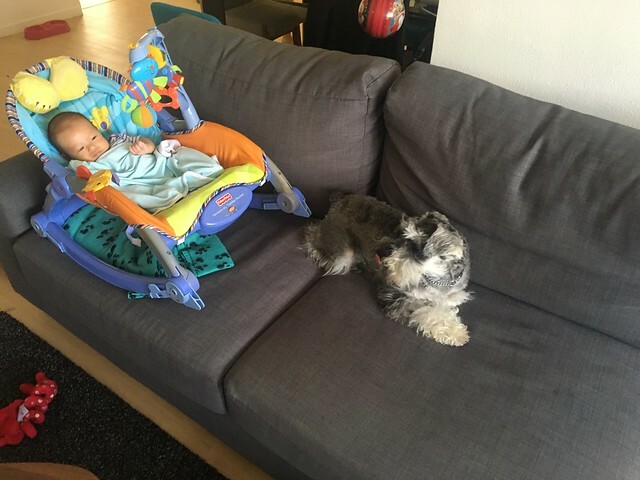 We slowly allowed him to get closer and closer to the baby. The next stage we went through was Buddy being relaxed around Dave but he would try to bite Dave’s socks off whenever he gets the chance to (for eg. when we left Dave in a rocker chair, Buddy would try his luck). At first we didn’t know that that was the new “progression”, it hit us only when we saw Dave with only one sock, and the other one lying on the floor somewhere far away. It was an interesting progression, and i witnessed it with my own eyes one day – somehow Buddy knew how to gingerly tug at the sock without biting Dave’s foot. I thought that quite cute – he knew he wasn’t supposed to hurt Dave, but he just had to have the sock! I can’t wait for Dave to grow up and play with Buddy. Dave can now reach out to touch and try to grasp Buddy’s fur. Good luck Buddy, I don’t know what Dave will do to you when he’s older (yet clueless). I wanted to say ‘Don’t say we never warn you’, but the truth is, we can’t speak your language. If you are not pregnant yet, it has a ‘Fertility Calendar’ that you can use to track your fertile days/ovulation days etc. It is definitely a very comprehensive app that is linked to the popular ‘What To Expect When You Are Expecting‘ book by Heidi Murkoff. With more than 17 million copies in print, this is a very very rich woman! 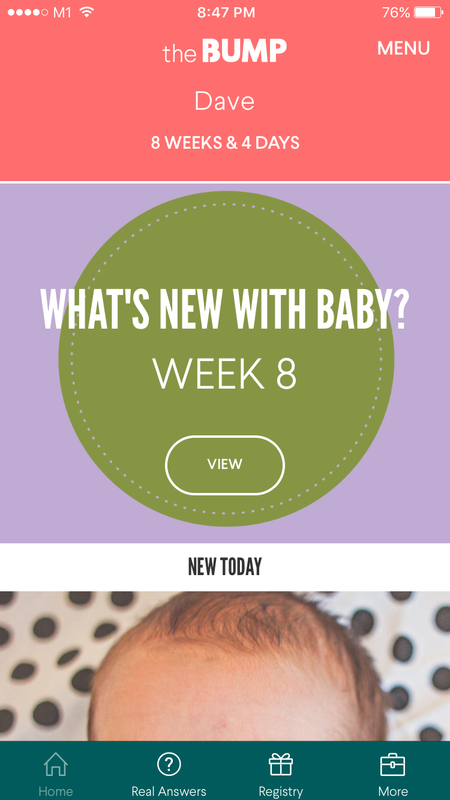 There is also a ‘Pregnancy by Week’ segment where you can read about the development of your baby in great detail. Every time I search for questions pertaining to pregnancy online, one of the top links (if not the first) to come up belongs to Baby Center. The website and app have such rich content, mainly also due to the community of members contributing to it. I have to say, there is NOTHING you cannot find to your burning questions. Except for ‘Baby Med’ which is quite useless after delivery, the rest of the apps above continue to provide very insightful information beyond delivery. One new app I have to add on to my collection is MammaBaby. I’ve tried some apps for recording of breastfeeding and diaper-changing times, but this seems to be the best so far. 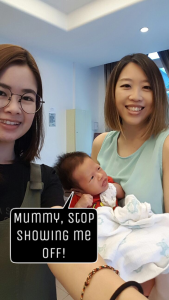 It allows tracking of sleeping times too (i didn’t bother to) and also lets you record the weight and height of your baby every time you visit the paediatrician. The ‘Summary’ is a great feature because it shows a graph with the data you input over time! 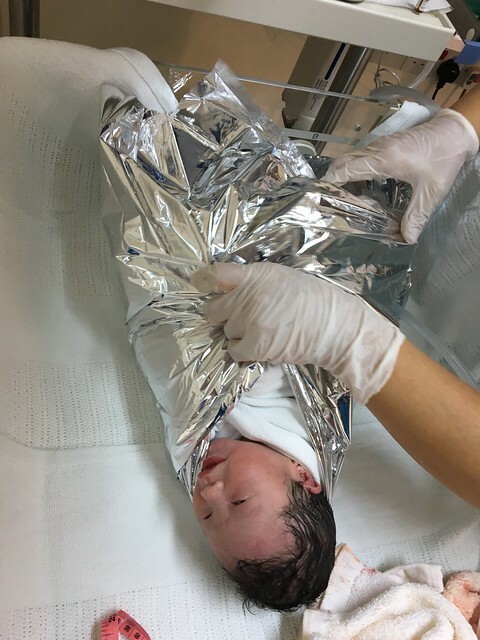 It doesn’t sound politically correct (to my son), but I’m gonna say it anyway – I didn’t feel the so called ‘love at first sight’, or the ‘I fell in love with you once i laid eyes on you’ sensation with my son (when he was first heaved onto my belly like a 3kg naked turkey). I remember the nurse passing him to me in the delivery room for the first time (for a trial breast feeding attempt). Funnily, he gave me an instant dirty ‘What are you doing? !’ look, complete with the typical frown inherited from his father. I still smile when I think about this today – obviously he couldn’t see anything much at that time, he probably was just pissed that he was no longer in the warm and tight environment he had been used to for so long. Likened to knowing a new friend, I have to say I like him more and more. It’s such a peculiar relationship – I felt more responsibility than crazy love for him at the beginning. And honestly, in between the sleeping, pooing, peeing, breast-feeing and crying, it was hard to have crazy love for this tiny being with so much needs that deprive me of so much comfort. But as the days go by… like what i’ve been telling my friends – “I like him more and more”. It’s like this new friend you got to know a month ago? Well, after much interaction, he’s starting to grow on you. So I never understand mums who said that they are so in love with their children ‘at first sight’. But then, maybe it’s because I never believe in love at first sight. I know that the road ahead is long, and there will be times when he will talk back at me, probably even hate me. But I reflect on my relationships with my parents, we all have been there, haven’t we? Maybe having a child is the stage in my life when I will finally learn unconditional love…. The best thing that happened to me in 2016 was the birth of Dave. I have yet to bathe Dave myself. 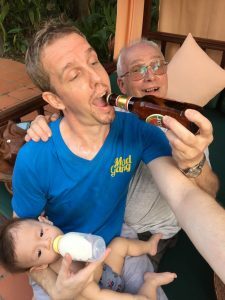 It’s all done by the husband, and I suppose it started off because I was experiencing weakness of my back muscles after delivery… and he just continued doing it, because it’s such a great bonding time for him and Dave! 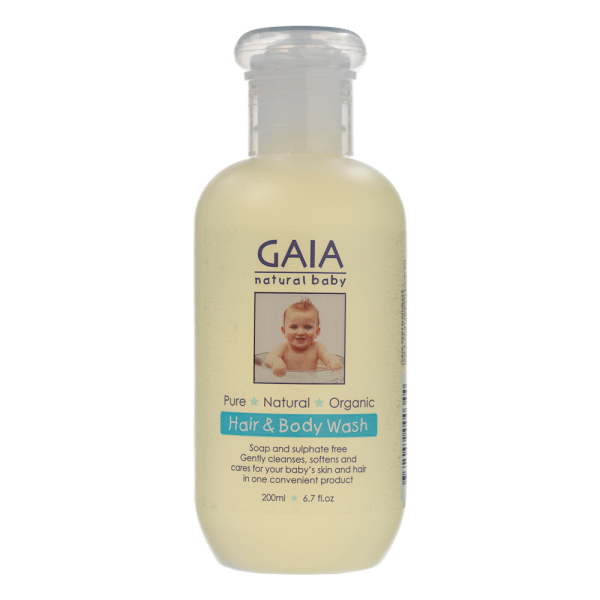 Baby Dave’s Bath with Daddy (ft Gaia Hair & Body Wash) from The Storyteller Wave on Vimeo. I can’t believe that we’ve reached the one month mark. Time flies when you are crashing at 1030pm very sleep-deprived every day and doing a repetitive routine of feeding and diaper-changing. 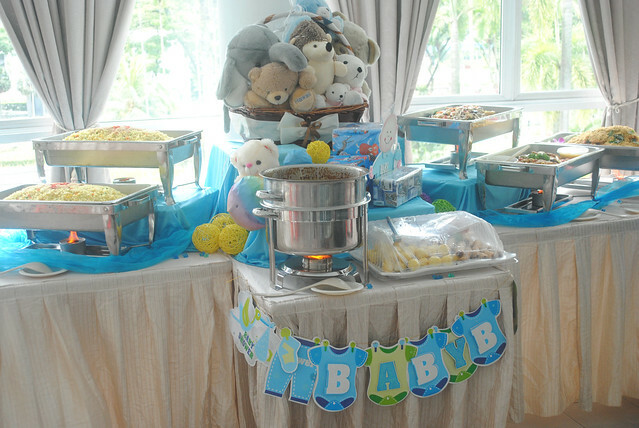 I was doing research on food catering for the full-month party during pregnancy, and at the end I decided on Neo Gardens, mainly because of the availability of the baby theme decoration, and the competitive pricing. Everyone was singing praises of the food (mind you, my relatives were not easy to please), so it was a relief that I had made the right choice. The food that was really palatable were the Thai Pineapple rice, and the Signature Curry Chicken (which was wiped out because my relatives happily dabao them home -_-). 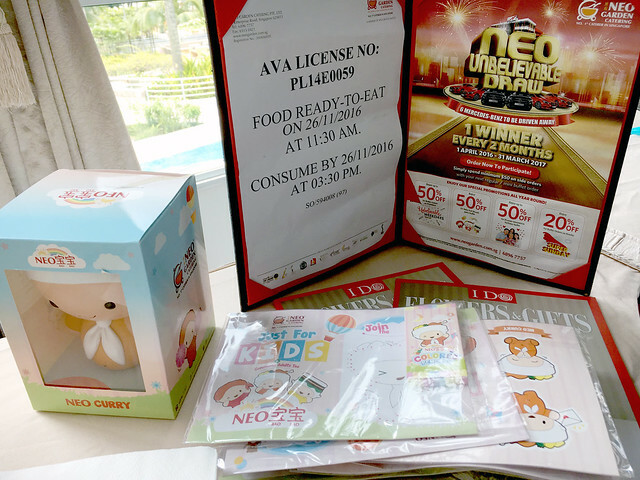 Last but not least, one thing that jumped out at me that day to show Neo Garden’s thoughtfulness – they even put out colouring packages for the kids at the party! Needless to say, the kids were occupied with the colouring (and the adults, happy). It went a little wrong only when the cape was in the way when we had to burp him. lol. 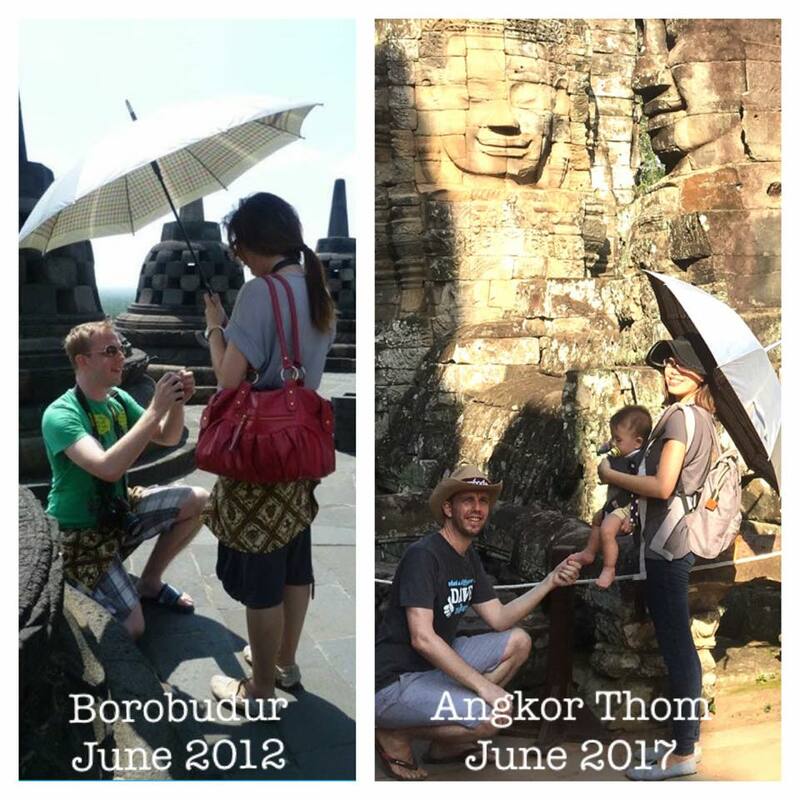 My husband and I decided to do away with a confinement lady, mainly because I don’t really like the idea of strangers living in my house, and worse, dictating what I should or should not do after a major life event like giving birth. I didn’t think that we should chance the risk of introducing friction into the house, as if handling a newborn wouldn’t be sufficient to deal with. But confinement food is a must…. (I love vinegar and rice wine!). 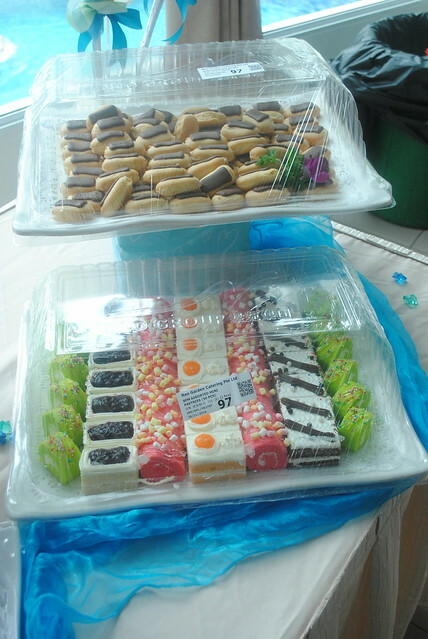 After doing some online research, I decided on catering from Kim’s Kitchen for my confinement meals. 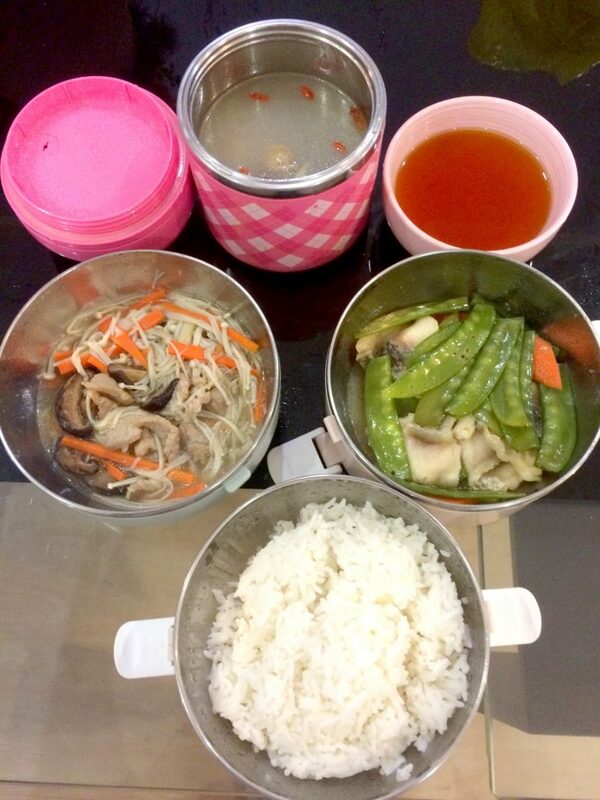 And that’s what made me decide on Kim’s Kitchen – the idea of home-cooked food (for 2 weeks of lunch and dinner) appealed deeply to me. I wouldn’t want 2 weeks of nyonya food, or food that is heavy in taste (after all, I had gestational diabetes, and eating ‘home-cooked’ while switching my palette over sounds great). It helps that Kim’s Kitchen offers a great deal too – order 1 month before your EDD and get a 20% off – that’s substantial! The 14 Days Dual Meal (Lunch & Dinner) costs $833.53 (incl GST), but after the 20% discount, it comes down to just $666.82 nett (averaging $23.82/meal). And boy, the serving was so generous, I usually cannot finish the food by myself; in that sense, it’s really value for money! 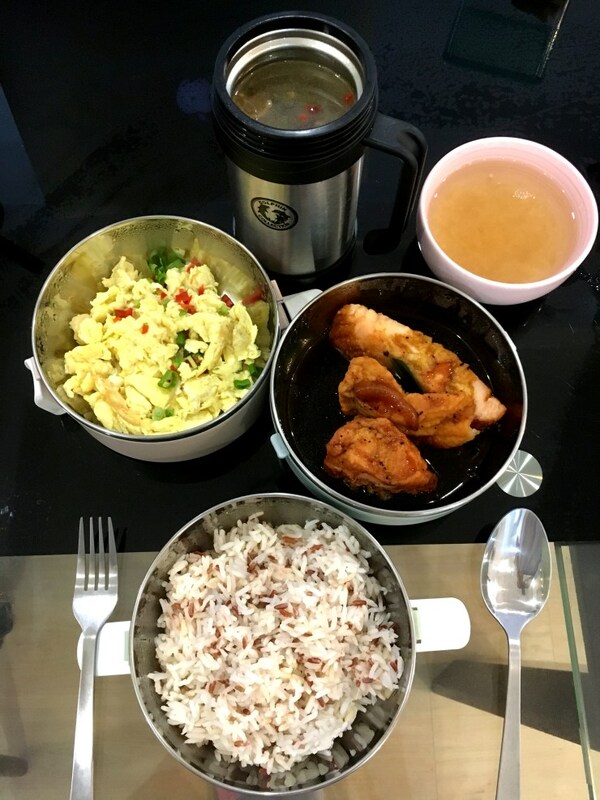 The meal comprises of a rice (typically brown rice), 2 dishes, 1 soup, longan red date drink and/or ginger tea. Here’s the English menu and the Mandarin menu if you’re interested to know the specifucs. It’s only $35 for a trial meal, and to enjoy the 20% off, they will require an email of documentation to prove the EDD (I emailed them a scan of my gynae’s appointment card, so that was simple enough). I had earlier indicated via emails that I would like to opt out of innards, but they sent me a dish of livers for one of the meals. That was quickly corrected after I texted a reminder. For the first couple of days, the dinner meals were delivered to my house at 4+pm, and I thought that was really too early. So I requested for a later delivery time, and that was quickly corrected too. 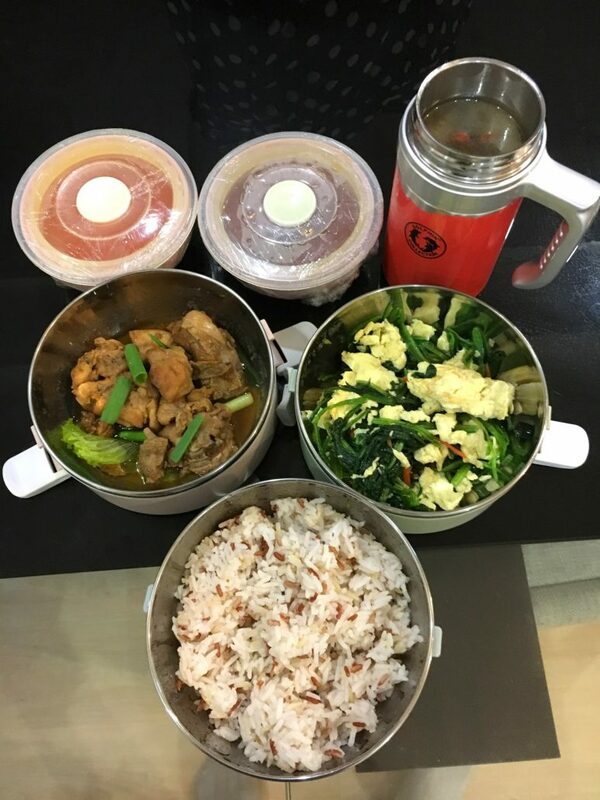 For the last day, I had forgotten to place the lunch containers outside my house for their collection (the last dinner was delivered in disposable containers), so I offered to have the husband deliver the containers to their shop in Joo Chiat. To my surprise, they said that they would make arrangements for their drivers to pick them up from me instead. I thought that was really nice, given that it’s my mistake. Despite the little hiccups, I would recommend Kim’s Kitchen because of the tasty food, generous serving, great value for money, and good customer service. Something to consider if you are not engaging a confinement lady! What I really like about this post natal massage is the fact that the masseuse comes to my house. It has to be done 5 days in a row (or 7 days, depending on the package you take up) for the best effect and luckily for me, I was assigned a senior massage therapist Mdm Tini! The batik cloth was given to me when I signed up for the package. 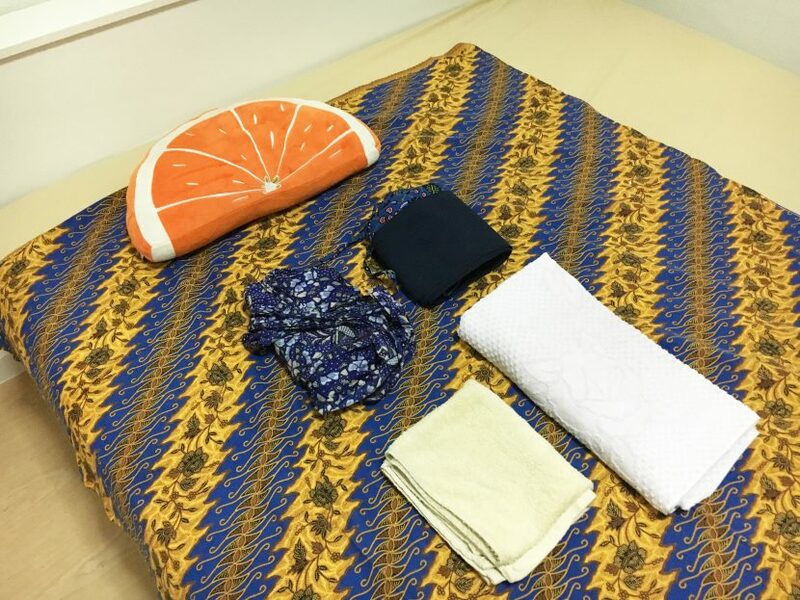 The 2 wraps in the middle of the picture were brought along by the masseuse on day 1; she uses these wraps to wrap the belly (very tightly) to assist the uterus to shrink back to its original size. Sounds incredulous? Well it works for me. 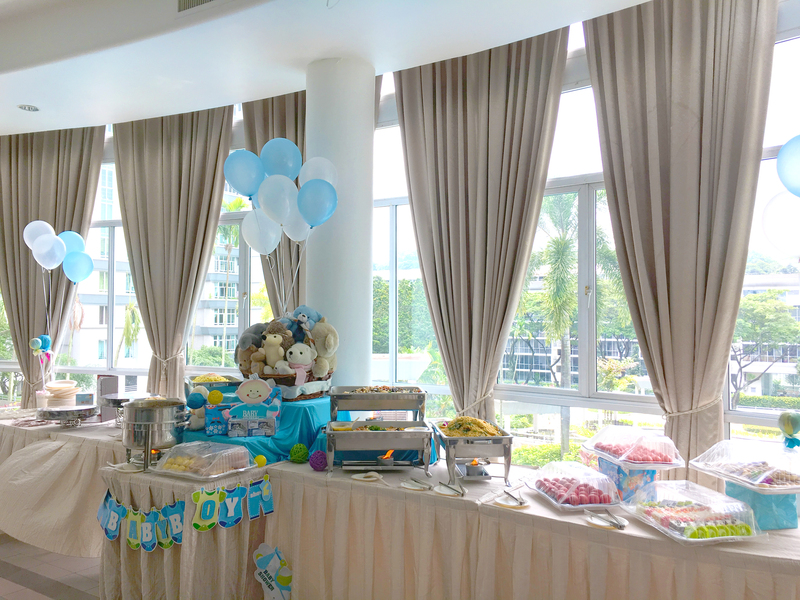 There was another benefit to my utter delight – after delivery, somehow my waist and back felt really sore and I couldn’t seem to be able to support myself to sit/stand upright. I found myself having to hunch (lower and lower) throughout the day because my back muscles were sore/weak. With this tight wrap as a support, I sensed an improvement in my back muscles after day 1! The improvement continued from there and now I don’t really have much trouble sitting/standing up straight (today is day 3 as I type this). 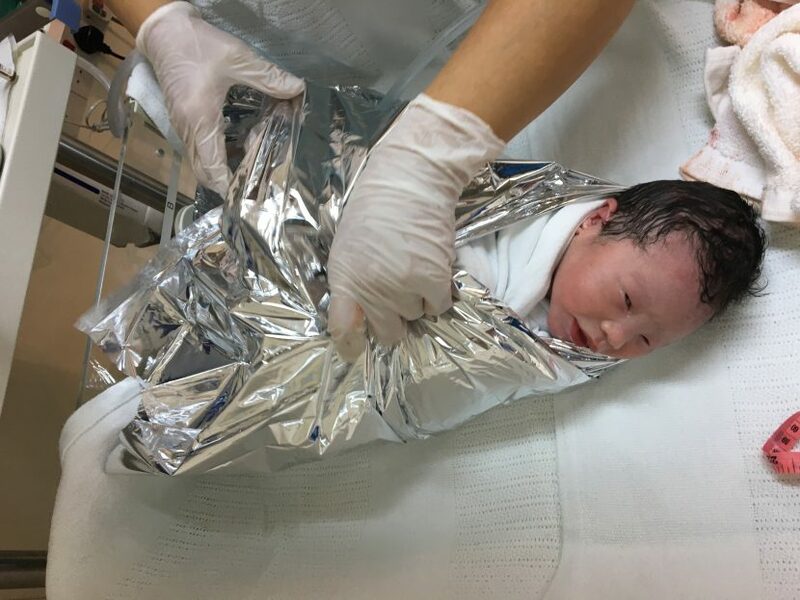 The wrapping of the belly has to be kept for at least 6 hours, and i probably wouldn’t find it too intrusive except for the fact that I had rashes prior to the start of the package (probably started from the itch as a result of the epidural at the hospital). What I have to highlight here is the professionalism of the masseurs and the management team. Madam Tini was the one to suggest that I take 2 days of break from the massage/wrapping so that there would be more time for the itch on my belly to go away. When 2 days were up, I called the office to request for another week’s break because I needed more time for the itch to totally subside. The management was very supportive and compassionate, and there was no pressure to rush me through the package. Definitely a thumbs up in terms of professionalism and service! 12 midnight – nurse came in to administer medicine (by drip) to help with contractions. 1218- the drip machine ran out of battery, so the alarm rang. The nurse was very helpful to offer to switch off all lights including the one at the headboard (leaving only the TV flickering on a static channel). That helped cos I really like darkness when I sleep. 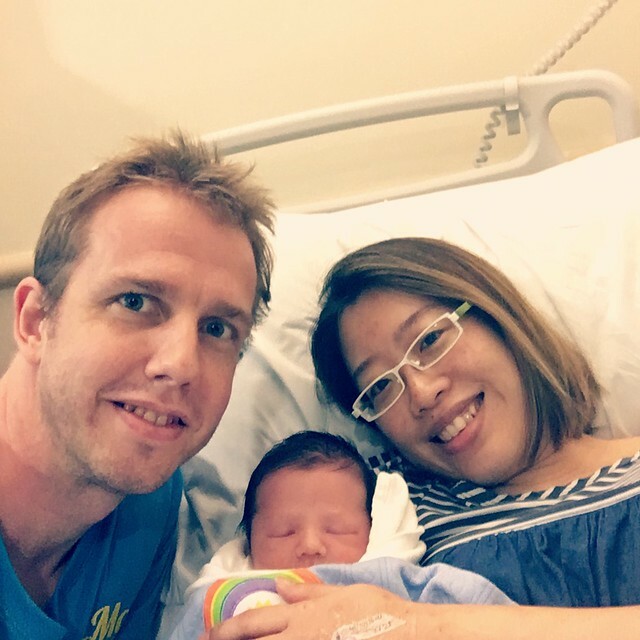 2am – The nurse came in to assist to turn my body to the right side so that the epidural will ‘balance out’. Before this point, this is probably the only duration I manage to catch a wink. 330am – The 1st dose of epidural finished with the alarm sounding again. Nurse came in to top up on dosage and measure my temperature. At this point, I realised that my body was itching (side effects of epidural) and had to reduce the flow from a 9 to a 7. 415am – Nurse came in to check cervix, which was at 4cm of dilation. I requested to reduce the epidural level to a 6 due to the itch (plus I was scared of using up the epidural and have to endure seething pain at the end). The nurse said that 6 is quite low though..
530am – too itchy to sleep properly despite lowering epidural. Requested for Dr to give medication for the itch . Funnily, the 3 of us had chats in between contractions. We chatted about England, and about how the delivery suites were all full that day because it was an auspicious day… (I was surprised because when I walked around the suites yesterday at 3pm, there were only 3 in use. Apparently everyone had checked in that morning for a good old C-sec). 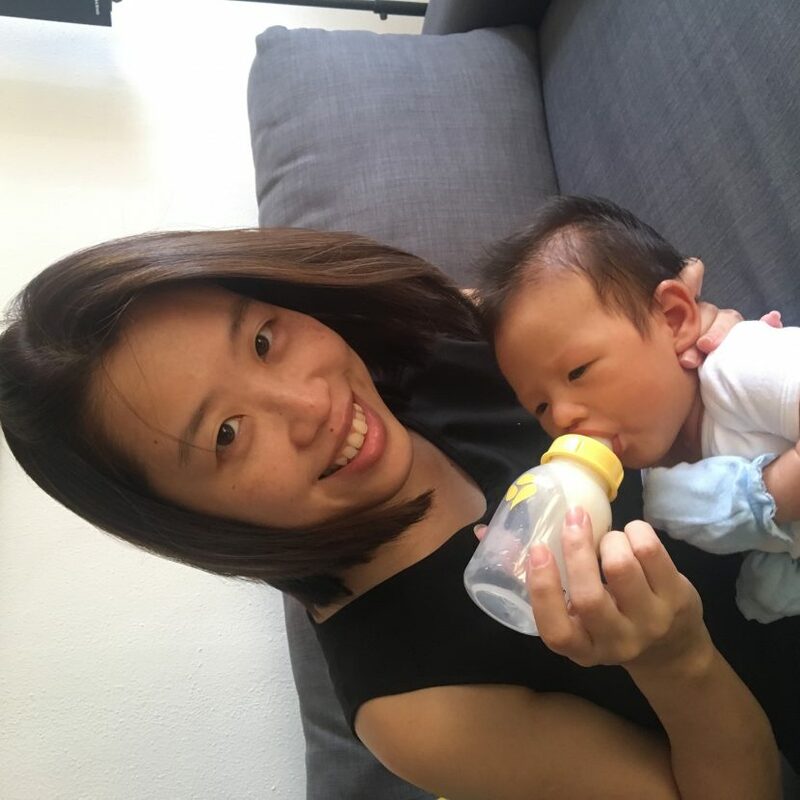 In the end, Dr Fong suggested that we use a vacuum, because the baby was getting tired …(excuse me, but I should be the one getting tired, having busted many of my facial capillaries). And here’s our family portrait! For a moment, we had pure joy.